Fayetteville State University (FSU) is a four-year, state-supported, comprehensive, liberal arts, co…. 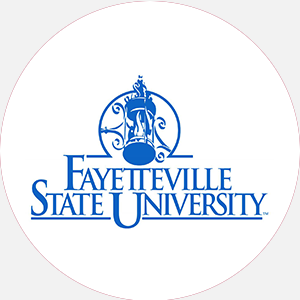 Fayetteville State University (FSU) is a four-year, state-supported, comprehensive, liberal arts, coed university. It was founded in 1867 as the Howard School by 7 black men who paid 6 for two lots as a site for the education of black children. In 1877, the North Carolina General Assembly selected this institution as a site for teacher training because of its successful record during the previous ten years. Thus, its name changed to the State Colored Normal School. Authorized to grant the Bachelor of Science degree in education, the name was changed to Fayetteville State Teachers College in 1939, and the school was granted state and regional accreditation in 1947. The name changed in 1963 to Fayetteville State College and again in 1969 to its present name, Fayetteville State University. FSU became one of the sixteen member institutions of the University of North Carolina System in 1972. Although FSU continues to expand its programs and facilities, the University remains devoted to educating students in the liberal arts tradition. FSU is committed to the concept that the mind should be cultivated and nourished for its own sake and for the good of mankind. To this end, FSU’s goal is to foster independence of mind, clarity of thought, and depth of spiritual vision that will inspire its students to contribute to the good of society. Located on 156 acres, the thirty-five-building campus has a mixture of modern and traditional architecture. This traditionally black school is a member of the American Council on Education and the National Association for Equal Opportunity in Higher Education (NAFEO). Fayetteville State University is accredited by the Southern Association of Colleges and Schools to award the Associate of Arts, Associate of Science, Bachelor of Arts, Bachelor of Science, and Master’s degrees. SAT or ACT required. Graduation from an accredited high school (or equivalent) with a minimum of 18 units to include 4 English, 3 mathematics (algebra I and II and geometry), 3 science (biology, physical science, and lab), 2 social science (U.S. history), and 6 electives. Two units of a foreign language are strongly recommended. Prospective students must submit official high school transcript with a minimum 2.0 high school GPA and have satisfactory combination SAT or ACT scores. Residents must successfully complete North Carolina Competency Exam. All students must undergo a medical exam by July 1 and show proof of immunizations. A nonrefundable application fee is required. Admission Application Deadline: Rolling admission. Admission Contact: Director of Admissions, Fayetteville State University, 1200 Murchison Road, Newbold Station, Fayetteville, North Carolina 28301-4298; Telephone: 910-672-1371; 800-222-2594 (toll-free); 910-672-1414 (fax). An Associate of Arts degree requires a minimum of 60 hours of course work and a 2.0 GPA. A bachelor’s degree requires a minimum of 120 hours and completion of core requirements with a cumulative GPA of 2.0 or higher and 2.0 or higher GPA in the major field. One year of study in residence required including 30 hours of course work. Senior year in residence required; special exceptions considered. Campus Regulations: Class attendance is required, and absences must be excused by the instructor. Campus Services: Health center; personal and social counseling; career counseling and placement; remedial instruction; testing service for SAT, GMAT, NTE, DANTES, CLEP, and GRE; job locator program to help students find part-time work off campus. Campus Activities: Social activities include theater, concerts, dances, and choir. Students may work on the student-run yearbook or newspaper. Leadership opportunities are found in the Student Government Association or numerous other student-run organizations such as the student-run radio station, WFSB, 98.5. Greek Life Sororities include: Alpha Kappa Alpha, Delta, Sigma Theta, Sigma Gamma Rho, and Zeta Phi Beta; Fraternities include: Alpha Phi Alpha, Kappa Alpha Psi, Omega Psi Phi, and Phi Beta Sigma. Honor Societies include: Alpha Kappa Mu, Phi Beta Sigma, Alpha Kappa Delta, Beta Kappa Chi, Delta Mu Delta, Kappa Delta Pi, Pi Gamma Mu, Pi Omega Pi, and Sigma Tau Delta. Housing Availability: 1,100 housing spaces; eight residence halls Handicapped Services: Barrier-free facilities. Disabled students are assisted through the Counseling Center and are provided with opportunities for University recreational and social activities. Associate of Arts: Biology, Business Administration, Chemistry, Computer Science, Criminal Justice, English, General Studies, Geography, History, Mathematics, Music, Police Science, Political Science, Psychology, Public Administration, Sociology, Spanish, Visual Arts Bachelor of Arts: Chemistry, Communications, English Geography, History, Political Science, Psychology, Music Education, Sociology, Speech, Theater, Visual Arts Bachelor of Science: Accounting, Biology, Biology Education, Business Administration, Business Education, Chemistry, Computer Science, Criminal Justice, Economics, Elementary Education, Finance, Health Education, History, Management, Marketing, Mathematics, Mathematics Education, Medical Technology, Music Education, Nursing (B.S.N. ), Office Administration, Physical Education, Political Science, Psychology, Social Science Education Preprofessional Programs: Predentistry, Premedicine, Prenursing, Prepharmacy, Pre-Veterinary Studies Master’s Degrees: Administration and Supervision, Biology Education, Business Administration, History, Mathematics, Mathematics Education, Political Science, Psychology, Sociology Doctoral Degree: Educational Leadership.